1. Youth (6-13 yrs): teams in the youth division are for athletes 6-13 years old. 2. Open Men's: teams that won in the first round of play. 3. Recreation Men's: teams that lost in the first round of play. 4. Open Co-ed: teams that won in the first round of play for co-ed division. 5. Recreation Co-ed: teams that lost in the first round of play for co-ed division. 1. Teams must be pre-registered to compete in basketball. 2. Teams may NOT submit competitors that are not pre-registered for basketball. 3. Only transplant recipients are allowed to participate. 4. All team members must be from the same “State Team.” For example, a Team Michigan player may not join with Team Utah/Idaho. 1. All games will be a part of the elimination tournament. After placement into the open or recreation division, the single elimination tournament will begin. 2. Three points are scored for a successful shot from behind the 3-point arc (19 ft 9 in. ), two points for all other goals from the floor. One point is scored for all successful free throws. 3. All teams will play in an opening round. 4. Teams winning in the first round will advance to the ‘open’ division and will play for the open medals. 5. Teams losing in the first round will advance to the ‘recreation’ division and will play for the recreation medals. All teams will be guaranteed at least two games in this format. 6. *Please note that teams will be required to provide one person to keep scorebook and game clock for the games they are playing – this person can be a team manager or spectator. 1. Games will consist of two 15 minute halves. 2. The clock will be on running time except for in the final two minutes of the second half. In the final two minutes of the second half, the clock will stop when play is disrupted by the official’s whistle. 3. Half-time will be five minutes in duration. 4. The ball must be taken behind the 3-point line after each change of possession (ball must be in the possession of a player whose feet are behind the 3-point arc). 5. After each made basket, the ball must be checked at the top of the key and thrown to another player to start play (No make it; take it). 6. Any foul during the act of shooting will result in 2 free throws for the shooter. The ball will be live if the second free throw is missed. If both free throws are made, the ball is awarded as if a team scored during regular play. 7. All other common fouls after 5 team fouls will result in a 1 and 1 bonus free throw situation. 8. A player, after committing five fouls, will be disqualified from the game. 9. If the game is tied at the end of regulation play, a two minute overtime period will be played after a one minute intermission. A coin flip will determine first possession in the overtime period. This procedure will be repeated until a winner is determined. 1. 1st, 2nd, and 3rd for the youth division. 2. 1st, 2nd, and 3rd for the open men's division. 3. 1st, 2nd, and 3rd for the recreation men's division. 4. 1st, 2nd, and 3rd for the open co-ed division. 5. 1st, 2nd, and 3rd for the recreation co-ed division. 1. No maximum number of players on a team will be enforced. No combining teams if there are not enough players. A team may continue with a minimum of two players, if no eligible players are available. 2. State Teams are guaranteed one team and allowed a maximum of three teams if space is available. 3. Teams entered in the co-ed division require one woman on the court at all times. 5. Teams at the top of the bracket will be designated the home team. 6. Games will be played half court. 7. All games will have certified officials. 8. First possession will be determined by a coin flip before the game between two team representatives. The visitor shall make the call and have the choice. 9. Each team may call two timeouts per game. Timeouts are one minute in duration and the clock will be stopped. The timer will sound the warning horn at the 45 second mark and play will resume at the one minute mark. 10. All players must wear court shoes. Balls will be provided (Wilson & Spalding). 11. In the case of an injured player during co-ed games only, the game in progress must be played to completion before any additions to the roster be made. Once the team/player has been allowed the “emergency roster addition” the original player is done for the tournament and will not be allowed to play for the remained of the tournament on ANY team. Co-ed teams have enough male players, 4 total with 2 max on the court, that the “emergency roster addition” will not include them until they are down to only 2 male players. Female emergency substitutes are allowed following the first injury. 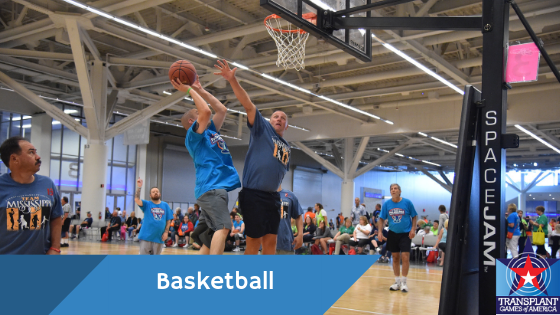 All emergency substitutes must be approved by the Tournament Director prior to ANY participation and are strongly suggested to not be a participant from another basketball team. 12. 50 x 30 full courts with competition played on half courts. The National Federation of State High School Athletic Associations Rules will apply with some adaptations. Once an event is completed and results are available, basketball staff must record all competitors and scores to the appropriate system/documents. When electronic scoring is being utilized a manual backup system must be in place to record results.